After three months, Donnie Dyck and his mom, Meg reunited with their family in Calgary. 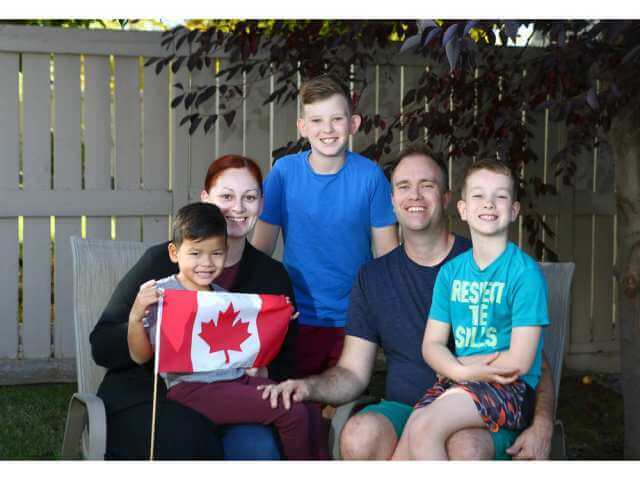 On Wednesday, the adopted four-year-old officially became a Canadian citizen. “We have a lot to celebrate, that’s for sure,” says dad Jeremy Dyck, who reached out to the Calgary Herald in early September to point out that while illegal immigrants were simply walking across the Canada-U.S. border into Quebec, his adopted son couldn’t get a visitor’s visa to come to Canada. The boy is super excited about becoming Canadian —“he understands that it’s significant and important,” says Jeremy. The boy was legally adopted by the couple one year ago in India, where they worked for three-and-a-half years as humanitarian aid workers. Jeremy with his two sons left India on July 4, expecting that Meg and Donnie would be no more than two weeks behind, once Donnie received his visitor’s visa. But the visa ended up taking more than three months to arrive. Donnie and his mom flew into Calgary on Sept. 16, one week after their story first appeared in the Herald.